Who hasn't ever eaten an entire pizza in one sitting? Don't lie. The founder and CEO of pizza chain Papa John’s has come up with a novel way to sell pies—telling his customers to steer clear of them. John H. Schnatter, who has referred to himself as the “Papa John,” took to British airwaves on Thursday ostensibly to promote his company’s resilience amid the global recession. Sales at the Louisville, Ky.-based chain spiked a record 13 percent in January and Papa John’s International, Inc. stock is outperforming the extra crusty market of late. But all that could change once Schnatter gets his way. “Pizzas are healthy for you if you don't eat too much of it - you can't eat five or six slices,” he reportedly told a surprised radio host who had asked for Schnatter’s take on a British government anti-obesity scheme. To be sure, it might have been an admirable moment of great candor and not a gaffe. As Papa John’s own website points out, one large pizza feeds three to four adults. Americans eat about 100 acres of the stuff each day, or to put it another way, 350 slices per second. Who knows what sort of further reckless gluttony would have occurred last Sunday if the Steelers had returned their opening kick off for a touchdown, thus forcing Papa John’s to fulfill its 25 cent pizza Super Bowl pledge? 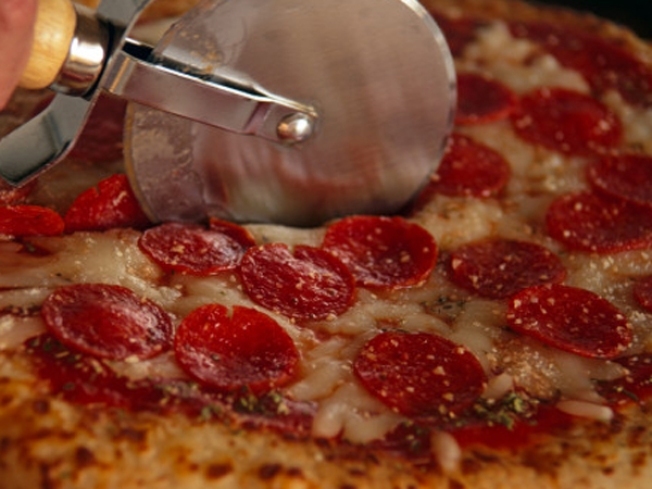 Too bad for Schnatter—and all of us—that Papa John’s doesn’t sell its pizza by the slice.